If you wish to con­duct a pro­gram in your Mosque, Islam­ic cen­ter or organ­i­sa­tion please con­tact us. Open to all Wifaqul Ula­ma , BMSC mem­bers and gen­er­al Pub­lic. Update and progress from Admin­is­tra­tive Depart­ment. Update and progress from Pub­lic Affairs & Legal Depart­ment. Update and progress from Inter­faith Depart­ment. Update and progress from Darul-Iftaa Depart­ment. Web­site, Social Media, App updates. Ramad­han and Shaww­al Moon­sight­ing. How will be respon­si­ble for their cities? 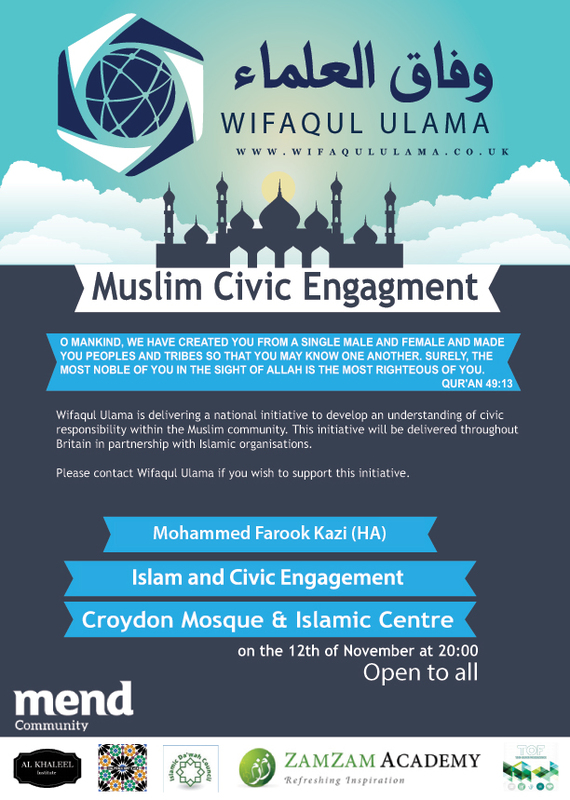 The first pro­gram will be at Croy­don Mosque & Islam­ic Cen­ter on Sat­ur­day the 12th of Novem­ber 2016 after Esha. 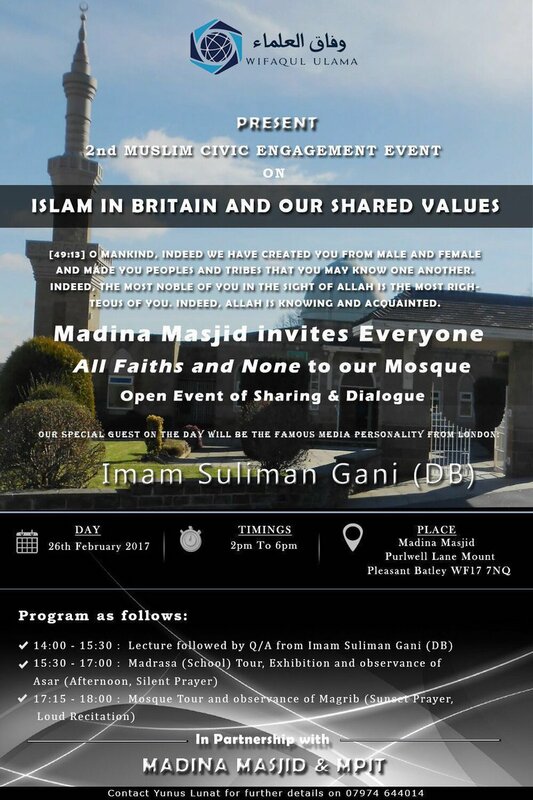 The sec­ond pro­gram will be at Mad­i­na Masjid (MPIT), Bat­ley on Sat­ur­day the 26th of Feb­ru­ary 2017 at 14:00. 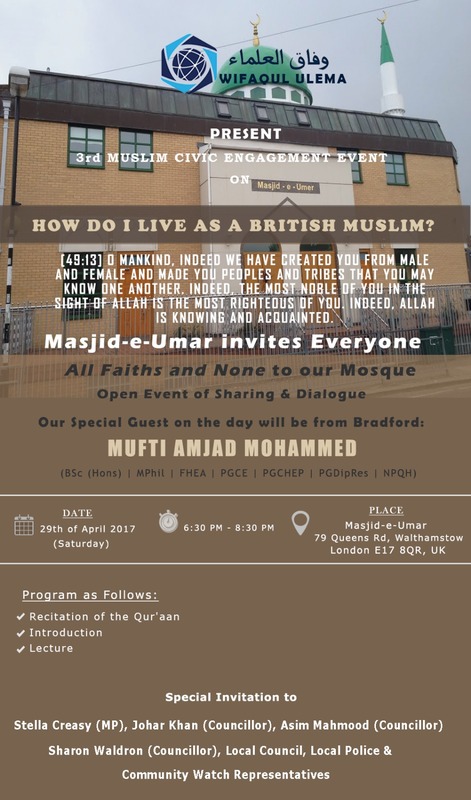 The third pro­gram will be at Masjid-E-Umer, Waltham­stow on Sat­ur­day the 29th of April 2017 at 18:30. The main lec­ture will be pre­sent­ed by MUFTI AMJAD MOHAMMED (BSc (Hons) | MPhil | FHEA | PGCE | PGCHEP | PGDipRes | NPQH |). The fourth pro­gram will be at Hayes Mus­lim Cen­tre, Hayes on Sat­ur­day the 23rd of Sep­tem­ber 2017 at 13:45. 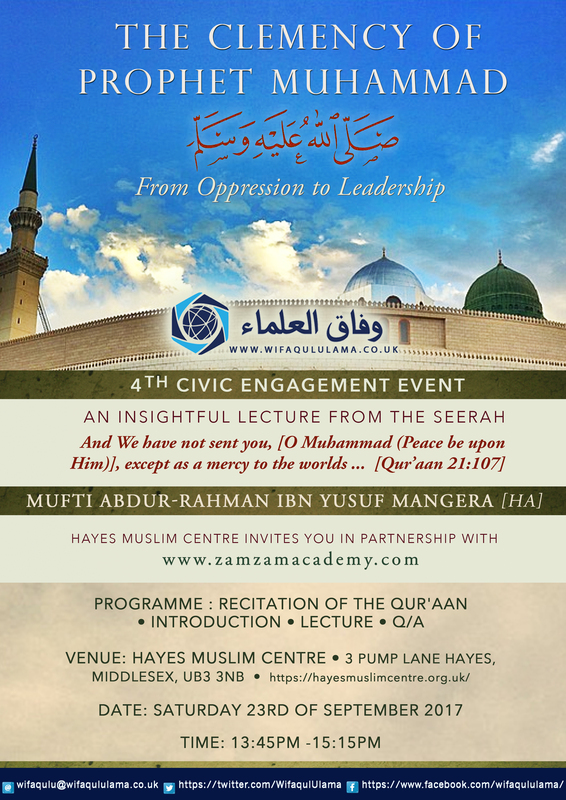 The main lec­ture will be pre­sent­ed by Mufti Abdur-Rah­man ibn Yusuf Mangera (HA). Wifāqul Ulāmā has been spe­cial­ly request­ed to cov­er issues per­tain­ing to Astron­o­my and their rel­e­vance to Islam and British Mus­lims. This pro­gram is not strict­ly in line with the pre­vi­ous four events but we have decid­ed to include it under this pro­gram.